Rent Astoria Exquisite Banquets | Corporate Events | Wedding Locations, Event Spaces and Party Venues. 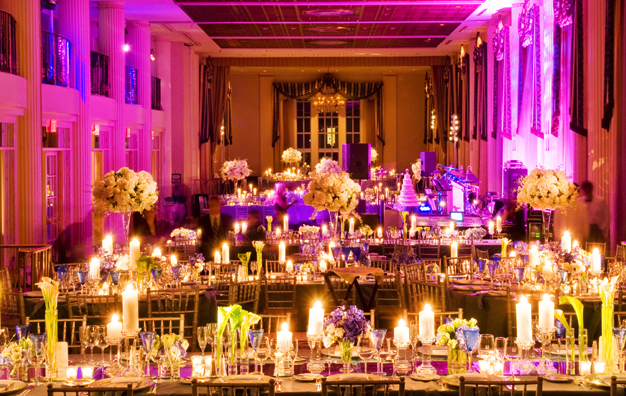 Reminiscent of a historic mansion, this unique venue is adorned with magnificent crystal chandeliers, diamond-cut glass doors, gold-embossed trims and moldings and silk-covered walls. The impressive interior echoes elegance - with a modern twist. Your wedding day is like no other day. And Astoria is a venue like no other. It’s gorgeous exquisitely designed to combine vintage glamour with a modern twist. Design features include magnificent crystal chandeliers lots of them diamond-cut glass doors, blush silk-damask covered walls with crystal sconces, a large porcelain ivory dance floor and a spectacular staircase that leads to private dressing suites. Not only is the venue stunning, but we’ve created unique, affordable and all-inclusive wedding packages that are specifically designed to ease to stress of wedding planning.